Dozens of been studies have been finding that caffeine consumption can raise blood pressure, increase headaches, lead to insomnia, restlessness and nervousness. These results are especially noticeable in those who consume more than 400mg of caffeine daily or just two retail coffees. 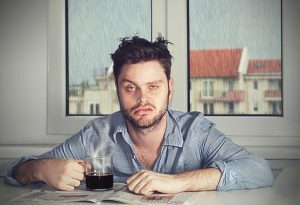 1) Caffeine likely raises blood pressure which may lead to an increase in cardiac events according to the Mayo Clinic. "Participants experienced a marked rise in blood pressure after consuming the energy drink as compared to the placebo. The effect was most dramatic in people who did not typically consume much caffeine, researchers found. Overall, the blood pressure increase was more than doubled in caffeine naïve adults after consuming the energy drink vs. placebo, they found." Some retail 12oz coffees actually contain MORE caffeine than found in common energy drinks. 2) The Norwegian University of Science and Technology has found that people who consume high amounts of caffeine each day are more likely to suffer occasional headaches than those with low caffeine consumption, a team of researchers at the Norwegian University of Science and Technology (NTNU) reports in a study recently published in the Journal of Headache Pain. Caffeine has a half-life of between 8 and 10 hours. Because of this it's not recommended to drink coffee after 2PM, when the effects of the caffeine are still active in the body. Researchers from the Sleep Disorders & Research Center at Henry Ford Hospital and Wayne State College of Medicine embarked on a study to analyze how caffeine disrupts sleep when consumed at different points in time during the day. One study found that caffeine consumed within 6 hours of bedtime reduced sleep time by one hour. Participants also had had a bias towards thinking caffeine taken more than 6 hours ago did not effect their sleep when in fact it did. Though you may not be able to feel the effect this far from originally drinking coffee, its effects continue.